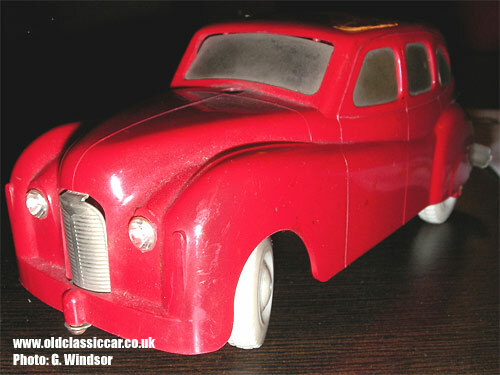 Plastic Austin A70 Hampshire car toy produced by Ever Ready. Toy car produced by "Ever Ready" of England. 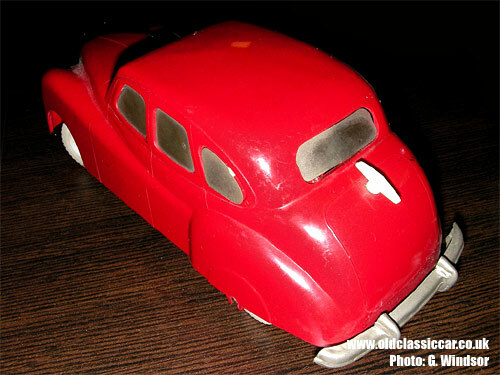 George was kind enough to email these photographs over, taken of a friend's very rare plastic toy car. It's modelled on the Austin A70 Hampshire of the post-war period, and labelled up as by Ever Ready - a company I'd more often associate with batteries, torches and so on. Missing its front bumper, the toy is otherwise complete - the hole on the scuttle ahead of the windscreen, is for the remote control unit, which had been removed before these photographs were taken. The A70 Hampshire was not a big seller for Austin, and a result lasted from 1948 to 1950 only, before being replaced by the Hereford. It would be reasonable to estimate that this Ever Ready toy also dates to the late 1940s or early 1950s. The motor arrangement can be seen in the underside view of the Austin. Alas the toy is currently a non-runner, but in its day must have been a much sought-after item by keen youngsters, perhaps wishing to ape their parents' driving habits, and/or tastes. Most of the toys I've seen in this style have been made by Victory Industries, this is the first I've seen sold under the title of Ever Ready. A search online brings up scant information on this particular toy. 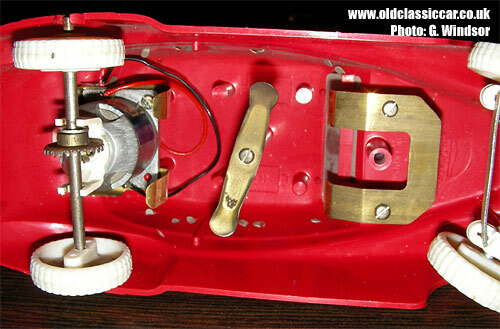 The book "Plastic Toy Cars of the 1950s & 1960s" has a photograph of a boxed example. That car, in white, was apparently produced in 1950 and actually made by Palitoy, on behalf of Ever Ready who did the selling and distribution it seems. Two versions are referred to, one with the remote hand control, and another which is steered by deft use of the over-size bootlid handle. Versions were produced in red, white, or blue - very patriotic! The original box features illustrations of the motorised car, and incorporates artwork to resemble that of a service station. An illustration of a boxed example can be found on the Vectis toy auctions website. All in all, a very rare item. Thanks to GW for sending the photos over. If anyone can shed more light on these toys, or has images of others produced by Palitoy but marketed as Ever Ready, please do drop me a line. For comparison, a photo of a real-life A70 Hampshire can be found on this page of the site.